When the slushy snow beneath Amelia Boone’s boots gave way as she hurried down the mountain towards the next checkpoint, she had no time to react. Her footing gave way sharply sending her tumbling 50 feet down the rocky, tree-lined embankment. She landed, hard, striking her head on the ground. Unsure if she lost consciousness momentarily, Boone sat up in a daze. She was not dazed enough, however, to know almost immediately that she was lost. Peering back up the steep rock face that she just fell from she could see no longer see the trail or any discernible markers indicating where she was. Even worse, this was her first time on the mountain. Taking a deep breath and wincing, she gingerly touched the spot on her head already beginning to swell and knew she couldn’t lose any more precious time sitting idle without a plan. She assessed the horizon. It would be dark in a few hours and she didn’t have any food in her pack beyond half a Power Bar and her water bladder was almost empty. “At least there is snow.” She thought to herself. Boone wasn’t a lost hiker on an expedition; or a damsel in distress on an unfamiliar mountain. In fact, she wasn’t even new to this kind of situation. She was 18 hours into what would be a 33 hour race, a Death Race to be exact that she had paid for and traveled to just days earlier. It was an endurance challenge that when all was said and done would involve 3,000 burpees, wood chopping, over a marathon on the mountain, two grueling rounds of Bikram yoga, and submergence under ice-covered water. Boone, who had just acquired her first axe weeks earlier, battled through the snow, fatigue, and exhaustion of the race alongside less than 50 others, roughly 10% being female before she finished. While lost, she ate snow for hydration and followed existing, unmarked trails until some snow mobilers directed her back towards her final destination. Despite being off-course for nearly an hour, she would ultimately emerge as the third place and only female finisher in the race. Three years ago, the road runner wouldn’t have been seen trekking through the Green Mountains, axe in hand. In fact, the witty and beautiful Boone would have more likely been seen in the University of Washington Law School library studying for her law school finals. Always an active athlete, the 28 year old attorney living in Chicago, IL had never considered herself an adventure racer or an ultimate challenge competitor. The Oregon native was comfortable outside and had made her way around the endurance circuit running marathons and regularly hitting the gym, but this world was one she had only recently discovered but was unequivocally excelling inside. Boone was making a name for herself. Just two months earlier in December, she finished World’s Toughest Mudder in New Jersey in as the second place female – one of only two female participants to not drop out of the over 24 hour challenge. The staggeringly low temperatures and high winds made the course especially painful to navigate for al who braved the conditions. Boone spoke of frozen wetsuits, painfully wind-burnt faces and hands, and hypothermic bodies dropping frequently as the race wore on and the conditions worsened. Starting with a field of over 800, the event would see only 10 finishers. Taking home no prize money, but a 25lb official finisher Kettlebell it rounds out a growing collection of finisher awards she keeps in her downtown Chicago apartment. “Medals and trophies are boring. Having a skull on your desk at work is always a great conversation starter.” Work for Boone is a law firm in downtown Chicago where she often logs 70 – 80 hour weeks. “There are no hills in downtown Chicago,” she muses, “I have to get creative in how I train.” Boone is often seen trekking up 40 stories in full work attire with a rucksack loaded with 40lbs to begin her workday. “Scaring partners isn’t always a bad thing.” She jokes. Boone races all over the country to find worthy challenges. She has completed a GoRuck challenge in Chicago (the award was a GoRuck Tough patch) the inaguaral S.E.R.E. challenge in Washington, D.C. (finisher award was a KA-Bar). Both events cleared 12 hours in time and at least 20 miles in distance while incorporating mental and physical elements for all the participants. GoRuck, the team-building event created and led by Green Beret’s celebrates camaraderie and team-building and the special forces inspired S.E.R.E. events are attracting people from all walks of life for participation. Boone is part of the growing number of desk jockeys, athletes, and weekend warriors seeking out the next challenge that will push them outside their comfort zone in an extreme way. 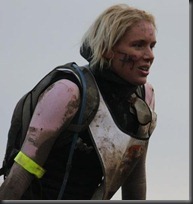 She plans on continuing her racing with several more challenges in 2012. The Spartan Death Race in June, a notable race on her list, is considered of the toughest endurance challenges in the world and has attracted less than 300 participants annually since 2005 because of it’s reputation for breaking competitors and it’s extreme level of challenge. In a landscape of traditional endurance races and pavement poundeing, Boone and others like her, are striking out into the non-traditional. The views from their heights are hard-earned and the fields are small, but the accomplishments, communities, and experiences are extraordinary for those willing to venture into the unknown. They are blazing new trails and proving that there are no limits to the possibilities when there are no borders and expectations. It’s the new normal and there are no rules when you head off-road.